Are you a VBScript guy trying to learn the new and cool way of doing stuff in PowerShell? Does it seem that everything is different now and you have to lookup the docs each time you want to do something you have been doing for ages? Fear not! Finally there’s a tool which does VBScript to PowerShell conversions for you. You type in the VBScript expression and it gets automatically converted into the PowerShell equivalent. 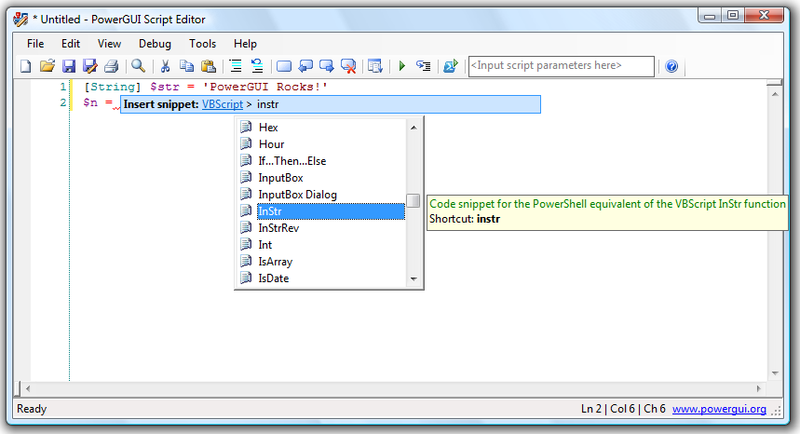 As you can see we have just added this functionality into the PowerGUI Script Editor. All you need to do is press Ctrl-B (or find VBScript in full list of Ctrl-I and find VBScript category there). Once you select the construct you need and hit Enter, the corresponding PowerShell code gets added to your script. The functionality is available in the latest update to PowerGUI – version 1.0.15 – which you can download from our community site. This does not work with PG 1.0.16. Typing vb doesn’t bring up any list as illustrated here. This is weird. Are you getting the snippets popup when you press Ctrl-I? Is it just that the VBScript section which is missing? Is this a fresh install or an upgrade from an earlier version? This is not a converter, it is merely an editor with the functions of vb added to snipping. You could just as easily use Studio Management for this. Are you sure? I am no longer with the project so maybe things changed – but this functionality definitely used to be in the free edition.